Adding an en suite will not only improve a master bedroom, but can add value to your property. It is recommended that a home has one bathroom for every two to three bedrooms, so if you need another bathroom and space is at a premium, an en suite might be the way to go. How big does an en suite need to be? Do you need planning permission for an en suite? So where is this new bathroom going to go? If you’ve got a big bedroom that could potentially be partitioned, or a little-used adjacent room, then adding or creating an en suite could be more straightforward than you think. This may mean designing a new bedroom in the process, but will help make sure you end up with a cohesive scheme. There are several things you need to think about before you go ahead and add a new en suite to your house, from the cost of adding the bathroom, to relocating plumbing, wiring the space and deciding exactly what sanitaryware to invest in. Just looking for inspiration? Check out our en suite design ideas instead. How much does an en suite bathroom cost? The most quoted, average cost of adding a new bathroom to a house is £3,000. This is inclusive of labour, fixtures, fittings and finishes like bathroom flooring, tiling and painting. However, adding a new bathroom to your house can vary in cost, depending on where your proposed bathroom is going to be. Ideally, you want to add your en suite directly next to an existing bathroom on the same floor, or above a bathroom on the lower floor. Why? It gets more expensive to add a bathroom if you have to redirect plumbing, especially soil stacks and waste pipes. It is possible to install a small bore pipe with a macerator, but this isn’t an ideal solution. You will have to factor in the day rates of a plumber, but again, it is difficult to predict how long this job is likely to take. It is far easier to estimate how much fixtures and fittings are going to cost once plumbing has already been sorted. A new bath will cost from £70 for a low end, acrylic model, but expect to pay from £300 to £500 for a good quality steel example. When you start looking at cast iron, stone and composite baths, expect to pay north of £1,000. This cost can vary quite widely depending on your choice of shower. A basic electric shower is cost effective, both to buy and to run. They can cost a little as £50, but look at paying between £100 and £200 for a stylish and functional unit. Power showers start at around £200, and feature a pump that increases the force of the water. Digital showers, shower towers, shower columns and shower cabins will cost £500 and up if you want quality, and advanced models can even cost as much as £2,000. A shower enclosure is an important decision, because this will create the overall look of the shower. A shower tray and enclosure combo will probably cost you around £150, but could cost you up to £600 if you want higher quality. When shopping for a shower enclosure, steer clear of outward-opening doors. Bi-fold, pivot or sliding doors are good for containing water in a tight space without swinging into the loo every time they’re opened. If you have the room, a walk-in enclosure means you have an area to towel off in before exiting. A wet room enclosure will cost upwards of £500 depending on the structural work required, this includes waterproofing, plumbing, the shower and a screen, if you’ve chosen one. The cost of a wet room shower can vary depending on your fixtures and fittings, and tiling it afterwards will need to be factored in. Bathroom sinks come in a range of materials and fitting methods. A simple ceramic basin is an inexpensive choice and will cost upwards of £50. Basins made for vanity units are more expensive, and the cost of the unit is usually separate. These can cost around £100 for a basic unit, but on average you will pay £200 to £300. Choosing a toilet is much the same as a basin, with ceramic, wall-mounted examples costing around £50. Expect to pay between £150 and £300 for a good quality toilet, and quite often, savings can be made by buying it in a bundle with a matching basin. Bathroom taps often come as an afterthought when your bathroom fixtures, but they are an important addition. A statement tap is usually enough to make even the cheapest basin look high end. You can pay as little as £20 for a basic mixer, and an average of £100 for a good quality one. To get something luxurious, you can easily pay upwards of £400, but this isn’t as extravagant as it seems if you have made a saving on your sanitaryware. The essential elements in an en suite are a shower, basin, mirror, towel rail, WC and lighting. If the layout is well planned, you could have an en suite with minimum dimensions around 150cm x 130cm. Appointing a bathroom designer will help you make the most of the space. If space is tight, choose space-saving sanitaryware such as a corner basin, corner shower, or even a toilet with integrated sink. Don't go too small though – the smallest size for a useable shower is an 80cm quadrant. Anything smaller than this is not going to provide an enjoyable showering experience. Unless you enjoy stumbling down narrow stairs in the middle of the night, a loft conversion with bedroom should also include an en suite. The biggest difference when installing one in the eaves will be head height. Pitch your shower at the highest point, or settle for a bath with a hand shower if necessary. Planning the plumbing might require a little more thought too – read more on this in our guide to designing a loft en suite. A fully tanked wetroom will provide a generous showering area, and solve any enclosure access issues. Make sure there’s enough room for towels and the toilet roll to be stashed far enough away from the showerhead or they’ll also get drenched while you’re washing your hair. A heated mirror and underfloor heating are useful in a wetroom scenario, which tends to be steamier. The top tip is to make sure your doors open outwards into the bathroom to maximise en suite space. Find more advice on designing a small bathroom. Adding an en suite bathroom should not require planning permission if the work is happening in an existing house. If you plan on adding a bathroom to a listed building, then planning permission is essential, as you will be altering the internal fabric of the building. Your project will also need to comply with building regulations. If installing the en suite includes rewiring, changes to drainage, installation or changes to a heating system that uses gas or solid fuel, and structural alterations you will need approval from building control. Any electrical work will need to be carried out by a qualified electrician, and work to boilers or heating systems must be conducted by a Gas Safe compliant engineer. If you are creating a complete new room or partitioning an existing room, then you will need to build extra walls. These will usually be stud walls constructed with a timber frame with plasterboard over the top. Choose water resistant plasterboard when creating a new bathroom to avoid damp. Having a stud wall built will cost you around £15 per m², not including any internal works, like plumbing and wiring, which will need to be planned out in advance. If you have a combi boiler, which provides hot water on demand rather than requiring a cylinder, you need to ensure that it has sufficient hot water flow to supply an extra bathroom. You should also check your water pressure and choose appropriate mixer taps and shower fittings. Most people choose heated towel rails for bathrooms, rather than radiators as these basically offer a solution to both drying your towels heating the bathroom. These can cost as little as £30 for wall mounted options, and can cost as much as £500, not including installation. The most important factor you need to consider when you're planning bathroom lighting is safety. There are strict regulations on what lighting can be used in a potentially wet environment. A lights IP rating depends on its distance to the water source, and that determines the type of light you can use. The higher the rating, the better protected the light. The bathroom is then broken up into zones that correspond with the IP ratings of certain lights. Lighting an en suite is similar to any bathroom. You need bright task lighting for illuminating your lovely face, and keeping that eyeliner level, plus subtler mood lights that will let your eyes slowly adjust to the reality of morning. Vanity lights should be placed either side of the mirror, at eye level, to prevent shadows. Don’t forget lighting inside the shower – it looks so pretty glistening off the water – but it will need to be IP rated for Zone 0 use. Zone 0 is inside the bath or shower, so the light needs an rating of at least IP67. Zone 1 is the area directly above the bath or shower to a height of 2.25m. IP45 is recommended, but it is always safer to go higher when this close to water. Zone 2 is the area stretching 0.6m from the perimeter of the bath or shower where a minimum IP rating of 44 is required. The outside zone is any area where water isn’t likely to go. However, if this is still within the bathroom, it’s a good idea to choose a light with a IP44, just in case. If your en suite bathroom is enclosed from the bedroom it is entirely up to you whether you match the design scheme of the bedroom or go for something completely different. If your bedroom has a serene and simple style – conducive to a good night's sleep – then it can be fun to go for a bold contrast in the en suite. A bright colour or patterned tile can bring plenty of interest in a small space. An en suite is often a luxury, and, if you have a family bathroom where function takes precedence over style, this can be the place to create that spa-like feel you really want. Splash out on large-format tiles in a high-end marble finish, or spend a little extra on taps and towel rails. Counter-top sinks are another boutique hotel-style design feature that make more sense in a grown-up en suite than a child-friendly bathroom. 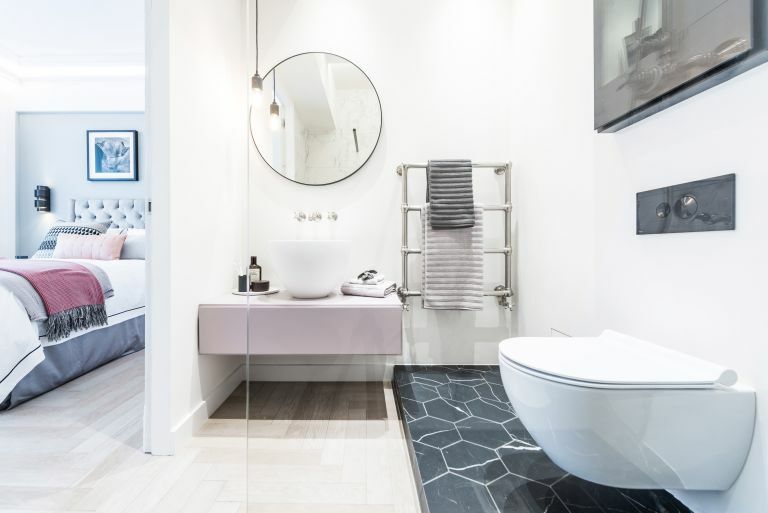 Our en suite design ideas will give you all the inspiration you need. If privacy isn’t an issue (even when on the loo…really? ), an open-plan en suite could be for you. More than just a doorless bathroom, the open-plan layout sports an extra-wide entrance that blurs the lines between sleeping and bathing. Your en suite will feel lighter and roomier inside – perfect for tidy claustrophobics, as any mess will always be on view. Those who aren’t ready for full exposure, or to keep toiletries tidy, might prefer a pocket door, which tucks completely out of the way when not in use. You can choose decor, furniture and sanitaryware that complements the design of the main bedroom. Instead of painting them both the same, choose a neutral scheme in the en suite and accessorise with items in an accent colour from the bedroom. Consider linking the bedroom and bathroom with a dressing room area. This could be a linking space with wardrobes between the rooms, a self-contained dressing room (if your bedroom is big enough), or just built-in bedroom storage surrounding the door to the en suite. If you like a carpeted bedroom, this will of course not be suited to the bathroom, but you could choose floor tiles for the en suite that match the colour. Alternatively, opt for a flooring type that will work well in both the bedroom and bathroom such as luxury vinyl tile. Think carefully about lighting circuits so that you can control the en suite and bedroom independently. You might want softer, dimmable lighting in the bedroom with brighter, task lighting in the bathroom.